Under the General tab, select an Access option for the category. 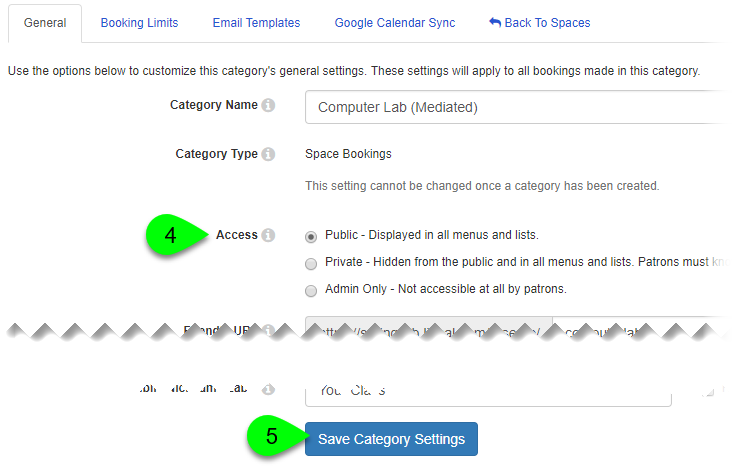 Public: patrons will be able to access the category's booking pages from all menus, lists, and widgets. Private: patrons will only be able to access the category's booking pages via their direct URLs. Links to the booking pages will not be included in navigation menus, lists, or widgets. Admin Only: the category's public booking pages will be disabled. Bookings can only be created by staff who are logged into LibCal, via the Spaces > Availability page.